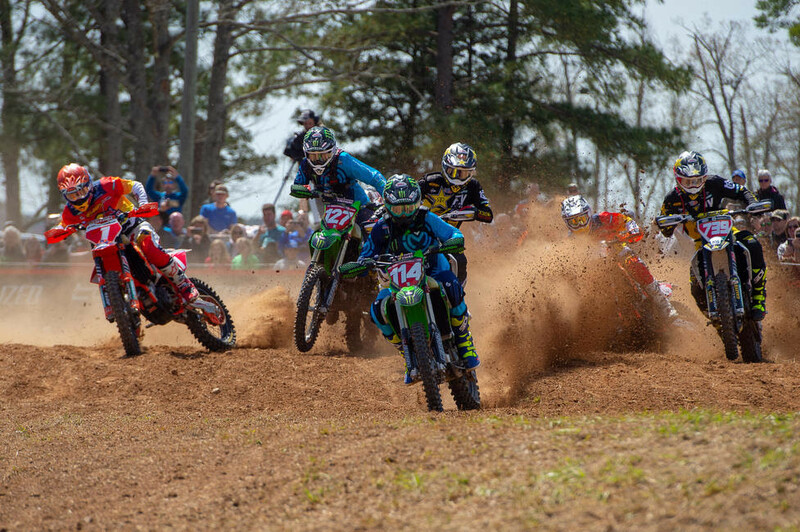 WASHINGTON, Ga. - The 2019 AMSOIL Grand National Cross Country (GNCC) Series presented by Specialized, an AMA National Championship, continued Sunday, March 17, in Washington, Georgia with The 15th Annual Specialized General GNCC. Partly cloudy conditions and cooler temperatures made for almost perfect racing conditions on Sunday afternoon. As the race got underway it was Babbitt's Online/Monster Energy/Kawasaki's Josh Strang grabbing the $250 All Balls Racing holeshot award. However, it was FMF/KTM Factory Racing's Kailub Russell pushing his way to the front of the pack as they came through timing and scoring on the opening lap. Russell would continue his pursuit for his first victory of the season, batting with the Rockstar Energy/Factory Husqvarna Racing duo of Trevor Bollinger and Thad Duvall. Bollinger would make the pass on Russell, holding the lead spot as they came through scoring on the second and fourth laps. Bollinger would hold off teammate Duvall at the end of the race to place second overall. Duvall would battle back after a fourth place start, holding the second place position as the two-lap card and white flag were out. However, a crash late in the race would have Duvall digging deep to salvage points as he came through the finish in third overall. For Russell it was time to push when he found himself in the third place position as the two lap card came out. Russell was able to make the pass for the lead stick as he put his head down and focused on the remaining miles ahead of him. As the checkered flag flew, Russell had placed a 13 second gap on Bollinger for his first win of the season. 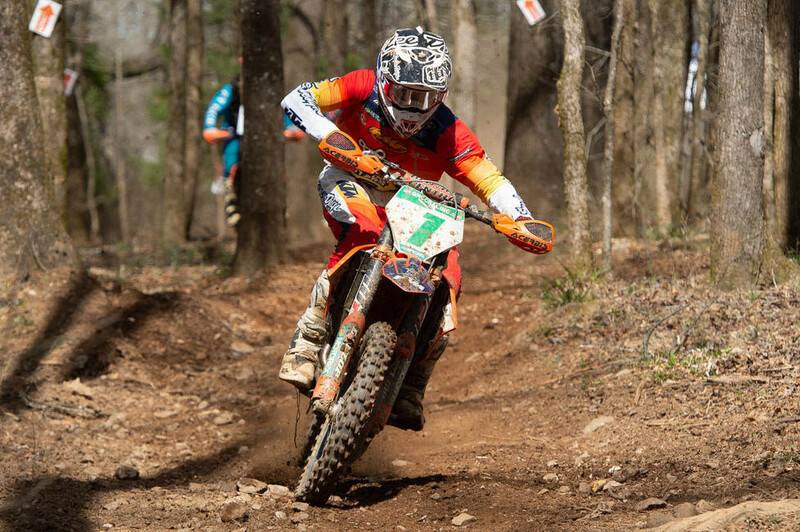 After earning the win one week ago, Tely Energy Racing/KTM's Steward Baylor Jr. found himself running in fourth overall for the majority of the race. Baylor Jr. held a consistent pace all day and now sits second, just seven points behind Russell, in the National Championship points standings. After earning the holeshot and heading into the woods Strang would battle throughout the day to stay inside the top five overall. Battling with Strang was FMF/KTM Factory Racing's Josh Toth, who had to make his way through the riders after an eighth place start to the day. Strang and Toth would swap the sixth and fifth place position several times before the conclusion of the three hour race. With just a few more miles to go, Strang would strike making the pass on Toth for fifth overall. Toth ultimately ended up in sixth overall. 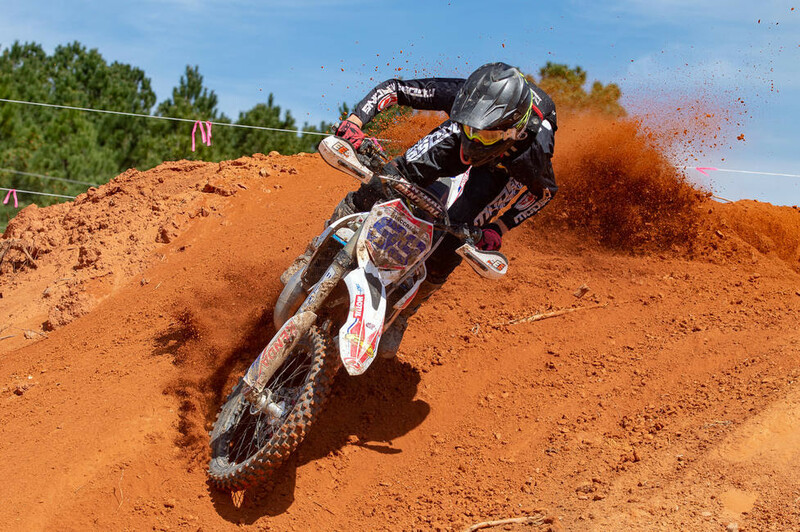 Strang's teammate, Jordan Ashburn held onto seventh in the XC1 Open Pro class with an eighth overall at the second round in Georgia. Ashburn held fifth overall on the second lap, but would fall to seventh for the remaining laps. Phoenix Honda Racing's Andrew Delong had another good ride, finishing eighth in class and ninth overall. As Ricky Russell remains sidelined with an injury, the AmPro Yamaha team headed to Georgia with a familiar face to GNCC Racing, the #121 of Cory Buttrick. Buttrick has a very long history in the GNCC series, and the team was impressed with how he finished out the 2018 season tenth in points as a privateer. Yesterday, Buttrick had a consistent race coming through for a top 10 finish in the XC1 Open Pro class. As the XC2 250 Pro class took off the line it was Beta USA Factory Racing's Michael Witkowski grabbing the $100 Hot Cams holeshot award. It wouldn't take long for Trail Jesters KTM's Ben Kelley to take over the lead and not look back. Kelley would maintain his lead throughout the race, gapping the rest of the class by 2 minutes and 23 seconds. Husqvarna's Evan Smith hails from Jefferson, Georgia, just one hour and 20 minutes from The Specialized General location. Smith made his way from fifth to second place in class, and managed to hold onto his first XC2 podium of the season. Trail Jesters KTM/MCS Racing/SSR Rider Development's Jonathan Girroir was on the gas as he made his way around Witkowski through a muddy section of the track. Girroir put in another great ride finishing third in XC2 and landing his second-straight podium finish. 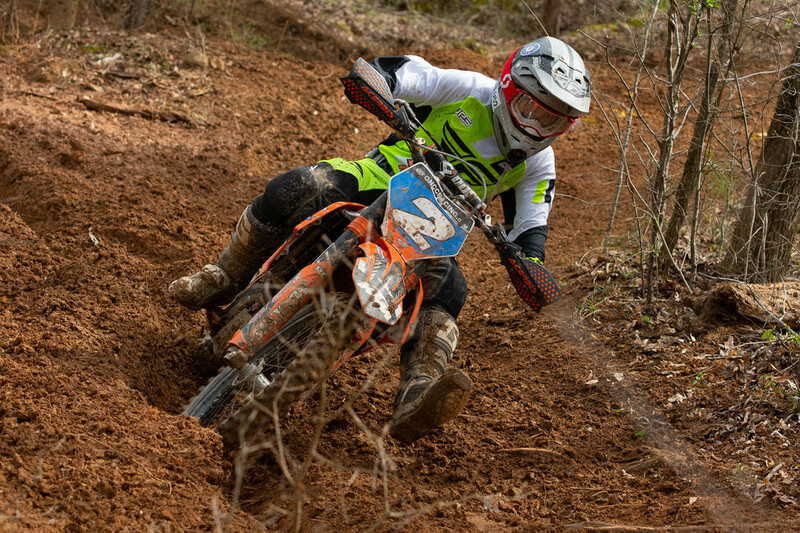 Witkowski and KTM's Ryder Lafferty rounded out the top five in the XC2 250 Pro class at The Specialized General. Witkowski, who landed on the podium at round one, found himself pushing the last couple laps to catch Girroir for third but was unsuccessful at making a pass stick. Lafftery, who finished 13th just one week ago, had a great race as he steadily worked his way up from a seventh place start on the opening lap. In the FMF XC3 125 Pro-Am class, it was Highland Temp Works/Offroad Riding Schools/Maxxis' Jason Thomas clinching the $100 Wiseco FMF holeshot award and holding onto the lead position throughout the first lap. However, Beta USA Factory rider Cody Barnes would make the move around Thomas for the lead on the second lap. Barnes would not look back after taking the lead, ultimately finishing five minutes ahead of Thomas on the day. Thomas held on for second in the XC3 class, followed by Yamaha's Jason Raines rounding out the podium in third. Defending Champion, Trail Jesters KTM's Jesse Ansley would find himself only completing four of the six laps after spending a lot of time in his pit area trying to figure out what looks to be a gas/carburetor issue. Brody Johnson came through in 22nd overall, earning the top amateur honors and 250 A class win. Chase Hayes followed in second followed by Bryce Koster in third. Hayes and Koster also rounded out the top three in the 250 A class. As the 10 a.m. race took off it was Rockstar/Husqvarna/Moose Racing/Shaw Wines Tayla Jones holding onto the early lead. However, as the women headed out on the third lap Fly/Maxxis/Pro Circuit/KTM's Becca Sheets would make her move to take over the lead, with KTM/MEPMX/Fly Racing's Mackenzie Tricker following her as she moved into the second place position. Sheets would hold onto the lead, taking the checkered flag with Tricker in second and Jones rounding out the top three. Beta USA Factory racer, Rachel Gutish had a consistent race finishing fourth in WXC followed by New Zealand's Rachael Archer rounding out the top five. Joseph Cunningham earned his second-straight youth overall win of the season Sunday morning at the conclusion of the 8 a.m. race. Cunningham not only earned the overall win, but also the YXC1 Super Mini Sr. (14-15) class win. Cunningham holds the points lead by two. Brayden Nolette, who sits second in the points, finished behind Cunningham in second overall followed by Canon Kuneff in third. Grant Davis came through in fourth overall, and first in YXC2 Super Mini Jr. (12-13). Cooper Jones and Georgia's Grayson Smith rounded out the YXC2 top three. The 1 p.m. bike pro race was broadcast LIVE in its entirety on RacerTV.com and can be viewed as archived video online by visiting the GNCC LIVE page online. A highlight show featuring the event will be aired on the NBC Sports Network on Sunday, June 2 at 11:30 a.m. EST. 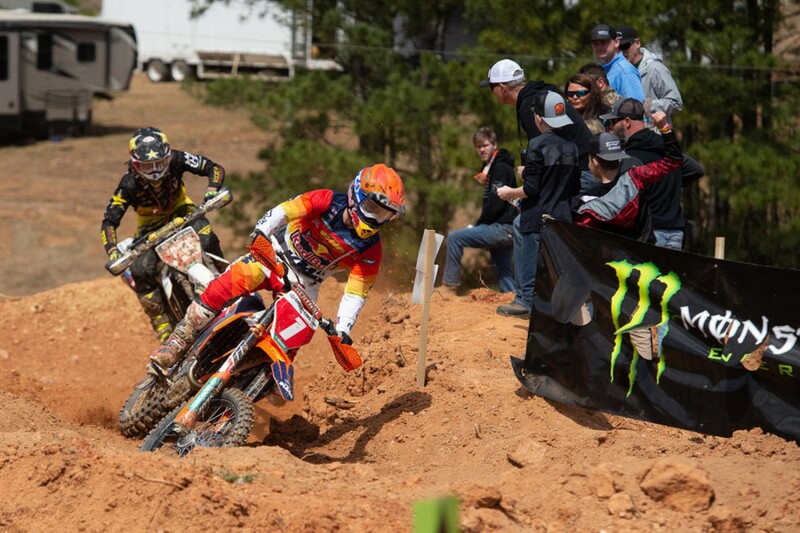 Tight racing, a controversial pass, and a KTM sweep. Indy had it.